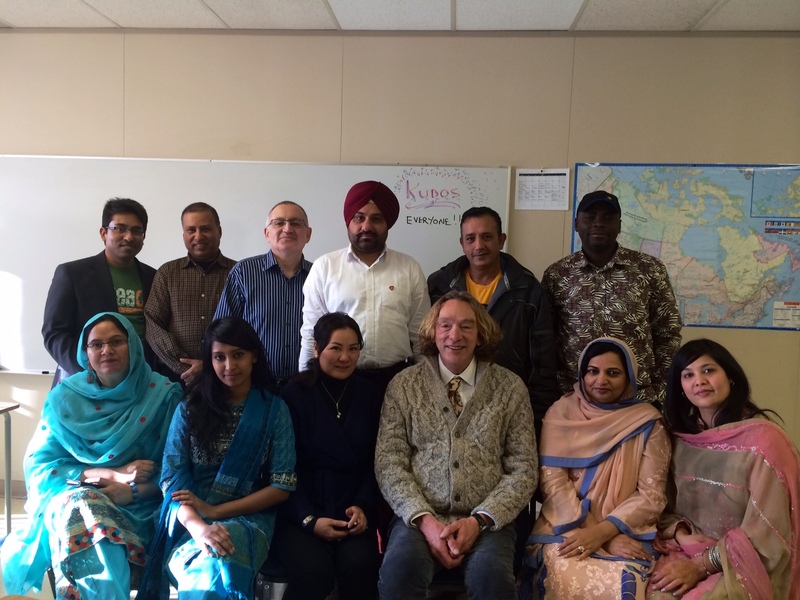 My students who come from (clockwise from top left) Bangladesh, Nepal.Syria, India, Egypt, Nigeria, Pakistan, Pakistan, (me from Saskatchistan), Mongolia, Bangladesh and Pakistan. Take a good look at this picture. For the last 12 weeks, these are the people I have spent most of my time with, these are the people I have come to know and love as my students in the MDRT program at ABES. The what at the what?? MDRT means Medical Device Reprocessing Technician. When you go for a treatment at the hospital or clinic, and hope that the instruments being used on you have been sterilized – that’s the function of the MDRT. ABES mean Alberta Business and Educational Services. It’s a school in NE Calgary that trains people in various medical areas, including lab assistants and health care aids and obviously MDRT. 4 years ago, the MDRT program was launched specifically to help internationally educated professionals (ie, immigrants) get a foot in the door in our health care industry. I was brought in to teach them something about the culture of the country and the language we use to talk about it. The people in my photo, all but three who are doctors, are probably over qualified for the position they are training for. Some will use it as a stepping stone to something grander. One of my former students went to the University of Saskatchewan and did a Masters in Public Health, for example. Others will complete the accreditation process (which is time-consuming and expensive) and become doctors here. When I first was asked to teach the course, I have to admit that as a Waspy kind of guy, I didn’t know much about new Canadians and their reasons for wanting to come here. Their situation, which I initially thought was peripheral to our culture, is in fact, I now realize, at its centre. We are a country of immigrants. Some of my own people got here in an early wave of Brits, as far back as the 1700’s. But still we came from somewhere else. Even our native people came from somewhere else, having walked here over the Bering Straight, albeit some 10,000 years sooner than the rest of us. A few years ago, I thought this class and my experience with it could lead to an interesting film. My friend Randy Bradshaw and I applied for some development money to get the process going. We were turned down. “This is not an Alberta story,” we were told. Look at that picture. It was taken last week in Calgary. If you think this isn’t an Alberta story, then clearly you are living under a rock or have your head lodged very far up one of your southern orifices. What are our stories? The one about the solitary prairie drifter falling in love with the beautiful young teacher from the one room school house? That was actually my mom and dad’s story. It happened in 1940. Maybe it’s time to move on and examine some new stories. Many of the people in my picture are Muslims, by the way. They are some of the most spiritual and peaceful people I know. I feel it’s worth saying because I believe anything that can help fight the stereotype we get constantly from the press is worth the cyber ink I spill to say it. These are lovely people. Their goal as doctors is to take away suffering. This is so apparent to me I feel embarrassed to have to say it, but I know there are people among us who harbor fears and resentment based on the popular press. Look at those faces! These are very good, kind, decent and gentle people. They are in our midst! And it’s a good thing! Remember this: The white Waspy version of Canada that some of us grew up with lasted only a couple of hundred years, only about 100 out west. This is a country in transition, in flux. Our new Canadians, like these students of mine, bring a wealth of experience and a vibrancy to this country that makes it a better place to live for all of us. This is Canada. This is Alberta. This is Calgary. This is my world. It’s yours too.